BRIGHTON, ENGLAND - Robert Soanes perhaps was not your typical British teenager. But he never considered himself to be a warrior, either. While most of his friends were following traditional pursuits, Soanes’s childhood love of East Asia was flourishing, with a passion for martial arts, samurai swords and armor. His obsessions grew and he even built a forge in his parents’ back garden in order to study the making of Japanese samurai swords and fittings. Now that teenage enthusiasm has developed into a full-fledged business as Soanes is one of only a handful of Western restorers of Japanese warrior armor. 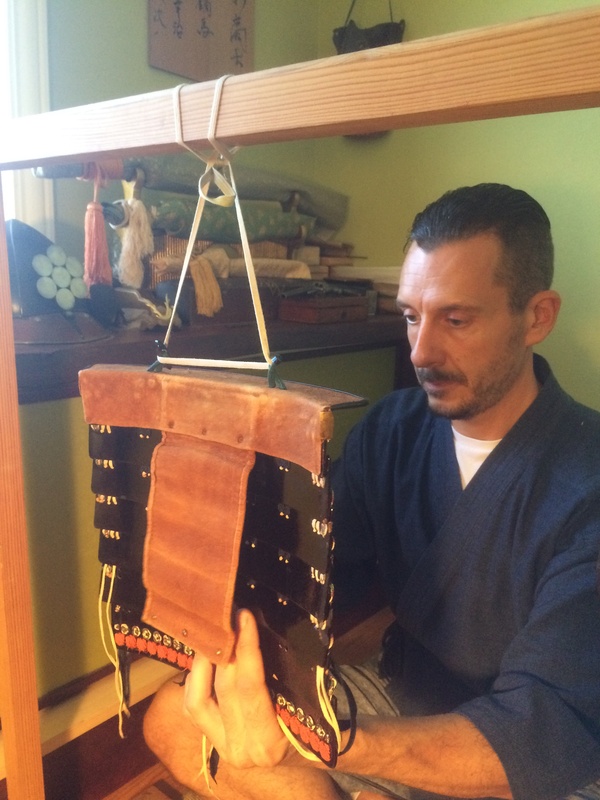 Visitors to his Brighton home might think they have been transported to a centuries-old Japanese workshop. 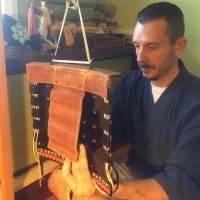 Soanes, 48, diligently restores different parts of armor, most of which is from the Edo Period (1603-1867) but some dating as far back as the 13th century. Traditional armor is made of either steel or leather plates, or a combination of both. A typical day for Soanes could include a variety of tasks all done by hand. These can include, for example, making lost or broken steel plates, restoring the lacquer on armor, lacing the pieces of steel and leather together with fine silk braid and making and applying decorations in the form of soft metal work or stenciled doeskin leathers of various designs. It is a long and arduous task and it could take over four months to restore a full suit of armor, said Soanes. “Clients often underestimate how long it is going to take,” he said. 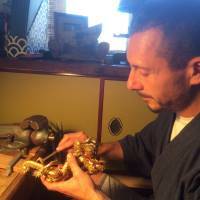 Trained as a welder, blacksmith and fine metalworker in Britain, Soanes has honed his skills over the years through self-study, visiting museums and working alongside master armorer Fumio Nishioka and his wife, Chizuru, in Yokohama. And it was that experience that propelled him into focusing full time on the restoration of Japanese armor, and his reputation has spread through word of mouth. 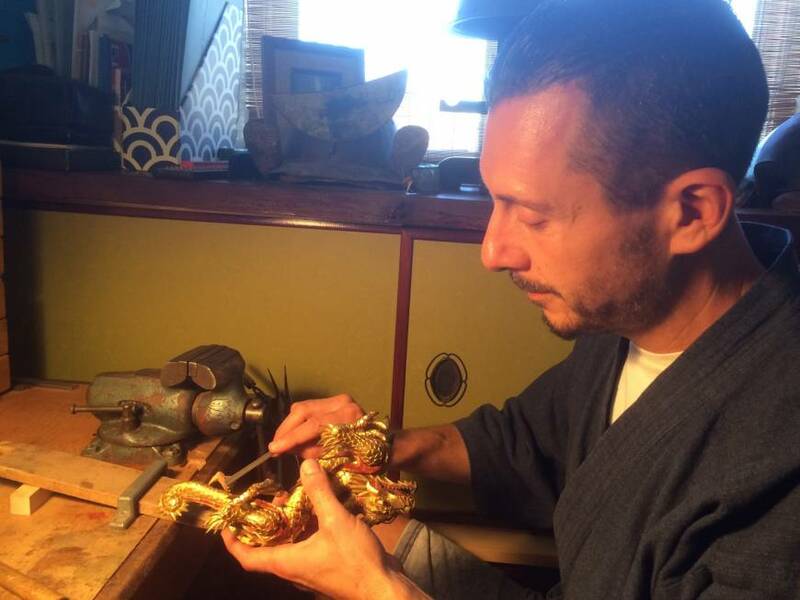 Sitting on the tatami mat in his workshop and dressed like a Japanese artisan, Soanes said, “I don’t want to blow my own trumpet, but I haven’t met anyone who can do the ‘whole bag’ — metal, leather and lacquer work — outside of Japan. He has a large collection of clients from all over the world, including private collectors, dealers, auction houses and museums. Normally, the armor will be sent to his home in Brighton. Alternatively, he will travel to the client’s property and do the restorations there. “Even some Japanese send me suits of armor to restore. Maybe I’m cheaper than the Japanese!” Soanes joked. He has a steady stream of projects and his workshop resembles something of a museum, with beautifully restored helmets, armor and swords. Soanes says that recent years have seen collectors move away from swords and into armor. As a result, prices have risen although they range vastly depending on the period, maker and provenance. “You get good and bad armor, from the partially mass-produced stuff to the more elaborate pieces for people with a higher social status,” Soanes explained. With growing popularity, more people have tried to restore armor, sometimes with disastrous results, as Soanes often has to try to reverse previous shoddy work. “Even in Japan I have seen poor, amateur restoration. For example, the silk lacing has not been laid properly or someone has put lacquer back on with super-glue,” he explained. The key to good restoration is to retain as much of the original work as possible and use the correct materials and historical knowledge to restore the rest, he said. Soanes says restoration allows you to see the “bones” of a piece and the hidden techniques used to make it. Although, occasionally a few surprises emerge in the process. “I was restoring a 17th-century neck guard and discovered the fingerprints left by the original lacquerer!” he said. Despite his devotion to warriors of the past, Soanes would never have wanted to have been one. “However, I would love to travel back in time and study with a master craftsman. Boy, they knew a thing or two!” he said.